In a keynote at NamesCon this morning, Radix founder Bhavin Turakhia ran through some of the metrics that Radix considers when marketing its top level domain names. One takeaway is that China isn’t all it’s cracked up to be for new top level domain names. It’s good for boosting registration numbers but longtime revenue is limited. 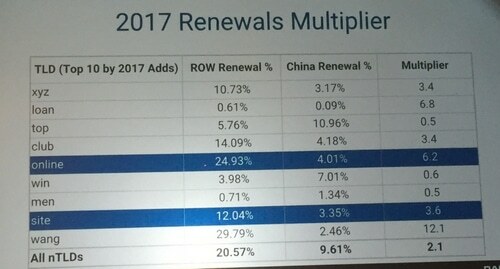 Radix’s domains are in blue and you can see the renewal rates are substantially higher outside of China. This probably has a lot to do with how domains are priced in China vs. elsewhere. 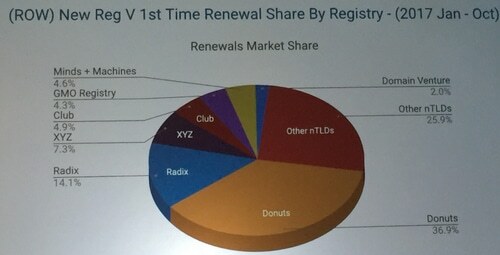 It’s interesting to see renewal share vs. initial registrations. Again, I think this has to do with how the companies source their initial registrations and their pricing. Turakhia says Radix uses first year renewals as its metric, not initial registrations. Whenever it undertakes a marketing campaign it runs an analysis to show that it will be profitable. It might not be profitable the first year but over time it needs to see a path to profitability.